Malik Seme smiles as he receives his gift from Santa. 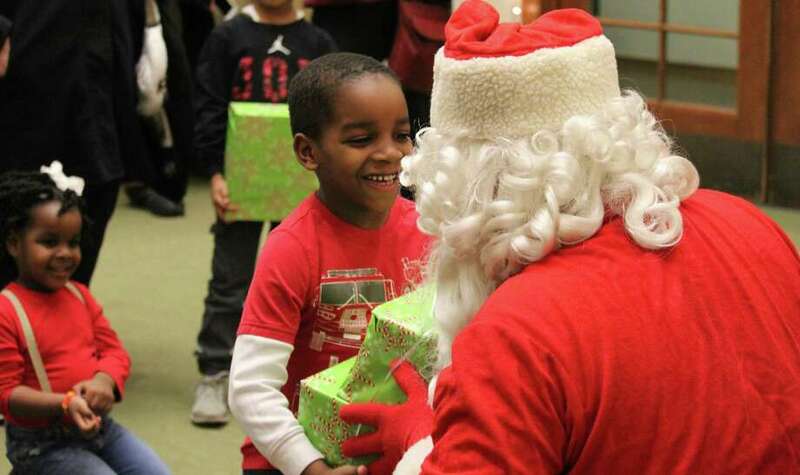 WESTPORT—Malik Seme joyously gazed into Santa’s eyes as he secured his arms tightly around two presents coated in bright green wrapping paper. It was the second year the 6-year-old and his younger sister, Faith, 4, watched Santa emerge out of a firetruck with a bag full of presents at the Westport Center for Senior Activities. The Westport siblings enjoyed juice and snacks with Santa, along with 14 other children and their parents on Tuesday. Malaika Seme, the mother of Faith and Malik, was injured last year and, as a result, it was difficult for her to go out and purchase gifts. Westport’s Department of Human Services invited her to the 2015 event, and Malaika said it was a great experience for her and her children. “I believe it’s a great program that the town has put together for families,” she said. Three years ago, Lt. Brett Kirby, of the Westport Fire Department, along with the department’s charitable foundation, started the Santa Gift Run where Santa visits houses on the fire truck and hands out gifts. For a set fee, families can sign up to have Santa come to their home with presents. After a wildly successful first year with hundreds of children visited, Kirby and Human Services Director Sarah Heath teamed up to provide a similar experience in a central location for those less fortunate in town. “The kids were very excited. It was a surprise for them, just a really feel-good event for them,” Kirby said. The families made a request for a specific gift for their child in a certain price range, and Saugatuck Financial donated the presents, Heath said.